Why should Commercial Accidents be investigated “properly”….? I specifically put the word “properly” in inverted commas, because the expression “proper investigation” is an oxymoron in my opinion. Is a “proper investigation” not in effect the only type that can exist? If an “investigation” is not “proper” can it still even be called an “investigation?” Considering the current design and application of the Police AR form, and the (lack of) vigor with which it is applied towards acquiring accurate data, why do police officers still insist on referring to their accident attendance as an “investigation?” To “investigate” – in my opinion - and as described by the Oxford English Dictionary as: “Investigate verb (investigated, investigating) find out as much as you can about something; make a systematic inquiry. From the outset, we have applied the part specifically that reads “find out as MUCH as you CAN.” What does this mean? Get the names, addresses and telephone numbers and registration numbers? In my opinion “as much as you can” means exactly that! Yet – people seem to refer to a “proper” investigation, as if there are levels of application. What do we normally do then - an “improper” investigation? 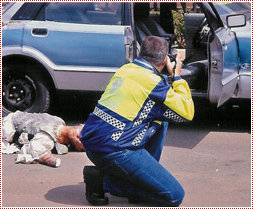 In my opinion – in South Africa – almost ALL investigations into accidents fall into this “other” category that is simply describes as an “investigation” without specific regard for the true meaning of the word. Our attitude towards ANY investigation is, and remains “We would rather have it, and not need it, than need it and not have it.” Is it necessary to do bulb analysis in the day-light? 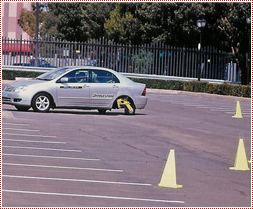 Should we test brakes in fender-benders when no-one claims vehicle brake failure? 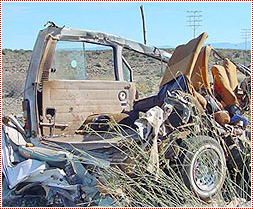 Should we INVESTIGATE accidents where no-one is injured, and vehicles are movable? First – we need to address the most pressing matter – WHAT should be “investigated” during an investigation, and what is expected when a “proper” investigation is done? Let’s first agree that the term “investigation” should not be applied insofar as the work done by police or traffic at accident scenes is concerned. Rather, it should be understood that they are there to “record” the accident. The current AR form is clearly designed with statistical analysis in mind. Very little information contained therein can be used or applied for “proper” investigative purposes. The first thing I often get asked when doing a presentation to a potential client or presenting to a group is “Why should (commercial) accidents be investigated in detail?” Certainly, I have NEVER been able to produce any intelligent semblance of an accident reconstruction from the information contained in the AR form. Yes – insurance companies want the “who, where and when” questions answered, so an AR number remains the holy grail of claim submission. But how much information contained therein actually contributes towards a “proper” investigation? Investigations should yield results – not statistics. Normally, without even thinking, my reflex reaction is to want to say: “If you need to ask, you deserve never to know.” But, the stark reality is simply this: Every year there are more than 500 000 accidents in South Africa, more than 10 000 people die on our roads and hundreds of thousands of people are injured seriously, and suffer long-term effects. Their lives are changed forever. Is THIS not justification enough? If we consider the simple fact that we cannot possibly hope to remedy any problem without first fully understanding it – where’s the hope? After attending more than 5 500 accidents in less than five years, at-scene, where the blood and guts is, I can tell you that there is a much bigger problem than we care to agree to. 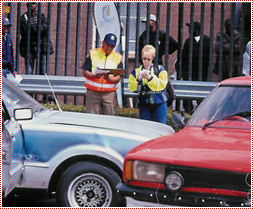 The South African Government is aware of a “problem,” and their PR angle is that they want to “reduce accidents at a regular annual rate,” hence the creation of “Arrive Alive,” and the flurry of advertising that accompanies it. But – let’s face it: Accident statistics, comparative figures and a relative improvement over previous years means absolutely NOTHING to the men women and children that die annually on our roads. It means less than that to the effected families, and even less to the blatant law-breakers out there. What is being done to ADDRESS the matter? What CAN be done to address the matter? And more importantly, WHO is ultimately responsible for ADRESSING the matter? So – what are we to do? Passing blame and exploring the historical failures will make no differences to the problem THIS year. Come December 2005, the deaths will occur. The victims will suffer, the numbers will increase and the losses will be suffered. And the PR angle will show that – in spite of 20 more people dying this year – things are better all around! This is where I wish to address the commercial sector. Let’s face it boys – as urgent as the issue of fatalities may be – you suffer enormous losses every time there is a commercial accident. Lives are lost and property is damaged. Productivity is affected, and you get negative PR. You may be sued, you have environmental cleaning hassles, and the recovery, clean-up, investigation, insurance excess and other expenses sets you back a mil or so! 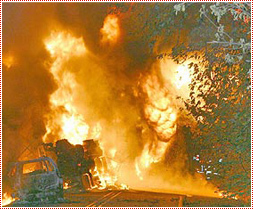 When a truck accident happens – the losses run into hundreds of thousands – often millions. So – let’s look at this problem with specific reference to your sector – the commercial transport sector. So, why should COMMERCIAL accidents be investigated properly? Firstly, there is the issue of liability. In a country infested with an opportunistic culture, ANY commercial accident involving a third party means that there is a fairly good chance that that third party might decide to sue. They smell money – and go after it. Sometimes these suits are six-figured – more often they are small amounts - amounts that will fly under the corporate accounting radar. Fifteen grand here - eighteen there - who cares? Pay them to go away - especially in those “your word against mine” scenarios. Then there’s the issue of staff abuse, and staff culpability. How many of you have had drivers experiencing a “black-out” on the road? Statistics tell us that there is a higher instance of drivers experiencing “black-outs” resulting in single-vehicle accidents than anywhere else in any other industry! The most urgent question remains: When you started your business, and drove your own vehicle/vehicles – how many times did you have a “black-out?” And – considering the high incidence of driver black-outs on COMMERCIAL vehicles, even shortly after they left their depots – why are there no similar statistics for other types of vehicles? 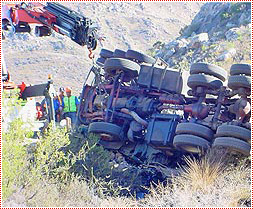 When we look at vehicle roll-over accidents (also often single-vehicle), why is it that a vehicle overturns on a bend with a 60 Km/h speed posting, yet we calculate mathematically that its roll-over (critical curve) speed is only 47 Km/h for that particular turning radius, vehicle/load and road camber combination - then we read the Tachograph and find that the vehicle overturned at 62 Km/h? Multiple commercial vehicle accidents almost certainly result in argument as to who was at fault. The stakes are high, and the eagerness to pass blame even higher. Often, we find ourselves even answering directly to the insurance industry because “allegations were made.” How do we untangle the absolute wrecks, in order to find out what the hell happened without a “proper” investigation? If a driver dies, what do we tell his family? Are they not RIGHT to expect that an employer at least tell them WHY their beloved husband or father died in an accident? Is the “closure” issue not motivation enough to at least be able to fill the hole of uncertainty left in the hearts of the remaining victims? From experience, I can tell you that CLOSURE in the absolute number ONE reason why we are appointed to investigate and reconstruct accidents for families, with insurance fraud riding a very strong first for the commercial sector. Let’s address training. The millions spent annually on driver training should certainly yield some results. But has there been a decline in commercial accidents over the last ten or twenty years? And – more importantly – since this is the issue that training attempts to address, has there been a reduction in human factor contributions? In our personal experience – no there was not. Sorry – but the fact remains that – no matter how much you train a driver – it’s his personal attitude, culture or disposition that determines his actions. When you simply consider the issue of alcohol abuse, we can let you know that there is NO link whatsoever between the level of education of a driver and his tendency to drink and drive. Students, pregnant mothers, attorneys, judges and even politicians are caught driving under the influence. And there’s a similar trend in speeding, stealing, corruption, fraud and even murder. 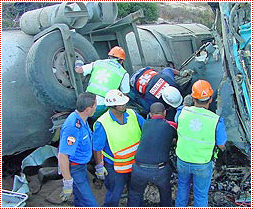 So – what difference does training make in your likelihood to suffer a loss due to an accident? And – how would you know if it is, or not, if you do not know who or what was to blame? Then there is the issue of prevention… What can be done to understand the specific occurrence of a particular set of circumstances – whatever they may be – in order to prevent a repeat occurrence? When a “proper” investigation is done, all issues are considered and addressed. What about bias? We know of numerous commercial transport operators that believe that they can save money by doing their own in-house investigations. The problem comes when they are called upon to testify to their findings, photographs, etc. Are they qualified as “experts” in court? Did they conduct the investigation with clear minds, and have no bias against the opposing party? Why did you photograph your left front tyre, and not the right rear? Hiding something? Who authorized you to take photographs of the other vehicle? How do we know you did not edit your digital photographs for personal gain? Why did you not share your findings with police investigators? All these issues are addressed in court-cases. We are experienced at all these lines of questioning. They are not. When a serious case of criminal or contributory homicide is lodged against the company for poor maintenance, are they equipped to defend themselves? What if the other party appoints an expert entity, like us, and the appointed expert has your internal investigator cross-questioned? Will he stand up to it? And – more importantly, what if the line of questioning wanders into the field of physics, human reaction times, etc. Is your investigator experienced or qualified for this? In court – unlike in the living-room with your wife – you cannot employ “wise” tactics to “win” the argument. It all rests on a totally different set of rules. And you should know what they are, or suffer the consequences. When a “proper” investigation is done, culpability remains the underlying result. The decision of “who was at fault” becomes clearer, as well as what can be done to address it. In the countries around the world boasting the lowest crime-rates, there are two identifying trends: Culture and culpability. Low crime rates are normally the final outcome of a very strict culpability trend, thereby leading to an improvement in culture. If you fire twenty drivers in a row for vehicle abuse, what are the chances that the remaining two would do the same? The culture would have changed. An extreme example yes – but I am sure you get the point. Experience – a wonderful word that – has taught us that, in companies that employ our services to “properly” investigate accidents, driver dismissal has been the most regular outcome. And not once has CCMA or even court action resulted in a reverse judgment. And the net result? The drivers now start crapping themselves when they see us on scenes. They KNOW that, if they were to blame, we will know and expose it. When they are not to blame, they come right up to us and tell us this. They will immediately refer to the problem, and remember everything. I am certain, however, that amnesia is the direct result of our presence – especially where drivers were in the wrong. But – what is a “proper” investigation? 1. Human Element – What were the Human factors that were present in the incident? 2. 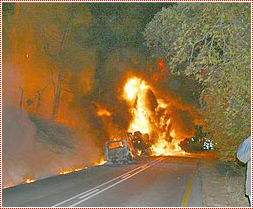 Environmental – What weather, temperature, visibility or other elements were present at the time of the incident? 3. Mechanical – What vehicle design, engineering, operational or maintenance factors are present? 4. Engineering – What road, structure or physical design elements are present? 5. 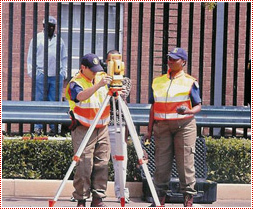 Law enforcement – What law enforcement element is present or absent from the location? 6. Corporate – What elements of corporate governance, policy or procedure is in place? 7. Impact – What impact will this incident have on any of the other elements considered? 8.  Forward engineering – What elements should, could, would, might or can be implemented to prevent a repeat event? Now – look closely, and you will see that the words relevant and contributory are not used at all. When we conduct a “proper” investigation, nothing is assumed to be relevant or contributory, or not. We do not CARE about contribution or cause AT the scene. That way, we are forced to consider EVERY conceivable element as potentially suspect – as the possible CAUSE of the accident. When we do our reconstruction, the contributory relevance of ALL elements of evidence is considered and analyzed. We would hate to find out some little piece of information later, only to find that the issue was never addressed, and the analysis or investigation into that element never done. Ultimately – it’s all about the TRUTH. In court you are asked “Do you solemnly swear to tell the truth, the WHOLE truth and nothing BUT the truth?” Even this seemingly cliché line bears relevance. How can you speak the WHOLE truth with only twenty percent of the FACTS?